Old man winter might be a regular guest across Canada but his visits don’t need to be a pain! Our Prince Albert snow removal and salting can take the sting out of those winter months. Throw down those shovels and pick up the phone to Gorilla Property Services. Fast, friendly, local service is only a phone call away. A bit of cool weather might be a reprieve from summer sun but it is not a far jump from light breezes, to full-on flurries. Snow storms might pop up unexpectedly but nothing catches our Gorillas off guard! 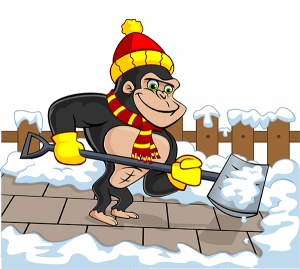 While snow might be overwhelming for other removal firms, our Gorillas have all the tools and “know-how” to keep your property running smoothly through rain, shine or a foot of snow. We might not be able to banish the snow but we can certainly help clear it away. A proper Prince Albert snow removal and salting service is not restricted to a 9 -5 schedule. It is no secret that some of the largest snowfalls pour down over the course of the evening. You might wake up for a midnight snack, only to find that your yard has become a pop-up winter wonderland. These types of snow storms never catch our Gorillas off-guard. Part of what sets our expert service apart is that our highly trained technicians monitor incoming weather in order to keep ahead of it. This means that we have a plan of attack against snowfall before that first flake hits the ground. In addition to being prepared in general, our Gorillas offer 24/7 emergency services for your Prince Albert snow removal and salting. It is no secret that large amounts of snow and ice are enough to keep some Prince Albert residents inside. This is a pain for those who are snowed in at residential spaces and for those commercial properties that depend on their customers staying mobile. Our Gorilla technicians want to make sure that each and every Prince Albert resident has the ability to move freely as they please, no matter the time or the place.